The Rastafarians call the representatives of a subculture that originated among African-Americans. Now the word "Rastaman in youth slang means a young man with the outward signs of a follower of the ideas of Rastafari. Clothing Rasta are the colors of the Ethiopian flag: red, yellow, green. And the most common accessory - "Rasta-hat . For this conceptual accessory, like a "Rasta hat , the shape is not particularly important. A cap may be in the form of a large shapeless beret, sports caps, tight head. Importantly, the cap present certain colors. Green, black, yellow and red. Strips of these colors may be repeated in this order, and may be interspersed black after each color. It just depends on your choice. Then select yarn for knitting hats. 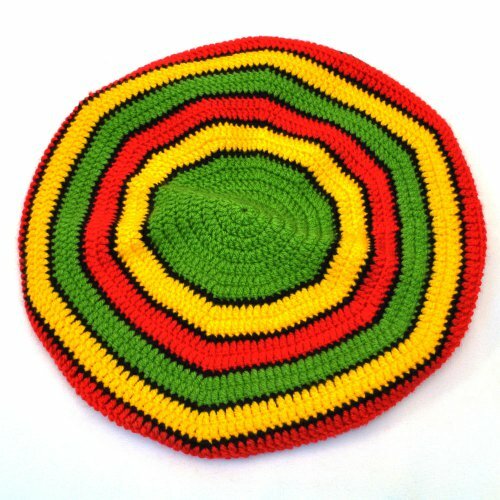 For summer Rasta hats are best suited cotton thin thread. Please note that the thread was not a lot of synthetics, otherwise it will be very hot and uncomfortable in the summer heat in this hat. If you are planning to wear the cap in the offseason, the ideal yarn would be fine of the wool. Now select method of knitting hats: knitting needles or crochet hook. If you know how to knit with circular needles for the hat it will be the best method. If the ability you possess, you can try method five spokes, a cap may be in the form of a cap. Crochet this hat to fit round the columns. The choice is yours. This hat fit tight binding, therefore, needles and the hook must be chosen in the following manner: a hook or spokes should be half thicker than the thread. Once you've chosen and binding method, make the sample which you then calculate the loop. Don't forget to wash and steam before doing this that you've connected. If you have a diagram of the knitting, you knit according to the scheme. If no ready-made scheme, measure the circumference of your head, calculate the number of stitches and begin knitting a hat, alternating colors of thread. Gradually add the loop at the beginning of the knitting, if you plan a regular hat. Apply knitting to the head, so you better Orient in the number of increases. If you knit a beret, then you must first associate a smooth circle of this size, any plan he takes. After this loop should gradually abated to takes firmly kept on the head and will not fall. Before buying thread update, do not fade. Otherwise the cap can deteriorate after the first washing. Associated wash the hat in warm water and only by hand.